Baxa, a leading developer of technology for the safe handling, packaging and administration of fluid medications, announces the launch of a new Facebook Page designed to influence a change in patient and medication safety practices. Businesses and brands can create a Facebook Page to share information, interact with fans and create a highly engaging, optimized presence in social media. Baxa, a leading developer of technology for the safe handling, packaging and administration of fluid medications, announces the launch of a new Facebook Page designed to influence a change in patient and medication safety practices. 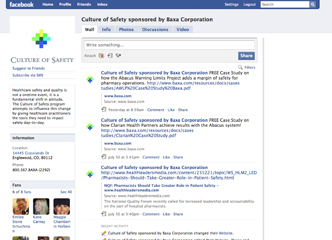 The Culture of Safety Page, sponsored by Baxa Corporation encourages pharmacy and nursing professionals to share experiences, insights and ideas for improving their profession and creating solutions that interject safety into the healthcare process. The site also serves as a portal for Web sites and resources related to establishing a cultural awareness around patient safety within specific health systems. "We believe that healthcare safety and quality is not a one-time event; it is a fundamental shift in attitude. Our Culture of Safety program supports this reform by giving healthcare practitioners the tools they need to be champions of this change," states Marian Robinson, VP, Marketing. Businesses and brands can create a Facebook Page to share information, interact with fans and create a highly engaging, optimized presence in social media. Reports show that an overwhelming majority of Americans, up to 93%, say that companies should have a social media presence. Baxa has adopted Facebook, the most-visited social networking site on the Internet, for its ease of use and functionality to facilitate discussions and meet marketing objectives. (1) Institute of Medicine, (2000). To Err Is Human: Building a Better Health System. Washington D.C.: National Academy Press. Baxa Corporation - Culture of SafetyHealthcare safety and quality is not a onetime event, it is a fundamental shift in attitude. Baxa Corporation's Culture of Safety program attempts to influence this change by giving healthcare practitioners the tools they need to impact safety day-to-day. The Culture of Safety sponsored by Baxa Corporation Facebook PageLink at: http://www.facebook.com/home.php?#/pages/Englewood-CO/Culture-of-Safety-sponsored-by-Baxa-Corporation/125887255588 Baxa CorporationBaxa, a customer-focused medical device company, provides innovative, solution-based technologies for medication handling and delivery. Privately held, Baxa Corporation has subsidiaries and sales offices in Florida, Canada and the United Kingdom; direct representation in Austria, Belgium, Denmark, Finland, France, Germany, Luxembourg, The Netherlands and Switzerland; and distribution partners worldwide. Further information is available at http://www.baxa.com FacebookFounded in February 2004, Facebook is a social utility that helps people communicate more efficiently with their friends, family and coworkers. The company develops technologies that facilitate the sharing of information through the social graph, the digital mapping of people's real-world social connections. Anyone can sign up for Facebook and interact with the people they know in a trusted environment. Facebook is a part of millions of people's lives all around the world. Facebook is a privately-held company and is headquartered in Palo Alto, Calif.